Probate is the legal proceeding to settle the financial and legal affairs of a person who has died (termed the “decedent”). In Washington there are two “levels”, depending on the size of the estate. The least formal process is the “probate by affidavit” intended for estates worth less than $100,000 and without real property. RCW 11.62. Larger estates require “probate administration”. RCW 11.28; 11.40 et. al. Typically, most case require little court involvement and are called a “nonintervention probate”. See RCW 11.68. The cost of hiring a lawyer to help with a nonintervention probate is relatively small. For example, according to a 2011 study of 50% of the probate cases filed in Stevens County, Washington the average cost for attorney fees to probate an estate was about $4,000 (with a low of $810 and a high of $15500). The average net worth was $149,000 (with a low of $1,277 and a high of $729,566). Thus, the average cost in attorney’s fees was about 2% of the estate value. In contrast, in California probate costs 4% of the first $100,00 of net worth of the estate and declines by percentage as the net worth increases. 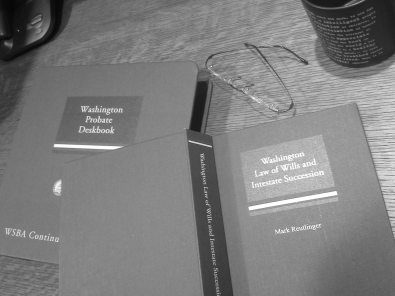 Less common in Washington is another proceeding, called a “full intervention” probate. See RCW 11.76. Most cases are “non-intervention” which means that once the probate is filed and the personal representative (aka “executor”) is approved by the court, the matter can be finalized without further intervention by the court. Typical nonintervention probates can be completed in about 6 months, including the 4 months required for the “creditor’s bar”- a process of publishing a legal notice to all unknown creditors to file a “proof of claim” within the time period or be forever barred from bringing a claim later against the estate. After the creditor bar has run the probate can usually be completed quickly and the estate’s net proceeds distributed to the legal beneficiaries. When there is a dispute about how the property of a deceased person should be distributed, either due to a Will Contest or to the handling of the estate by the executors (called personal representatives in Washington), we can help you determine your rights under the law and figure out how to set things right. Will contests are governed by RCW 11.24, while most other estate disputes are handled through the procedures in the Trusts and Estates Dispute Resolution Act (TEDRA), found at RCW 11.96A.